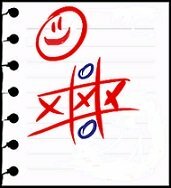 Tic-Tac-Toe is a classic children's game that is easy enough for preschoolers yet entertains school age children also. Most often, it's played on scratch paper using X's and O's. The rules are simple. You start with an empty grid of nine spaces. One player is X, the other is O. Players take turns placing their symbol in one of the nine spaces. 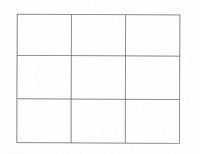 The first player to get three of their symbol in any horizontal, vertical or diagonal row is the winner. This holiday version adds a new twist. Instead of X's and O's there are holiday symbols for added fun. There are baskets and chicks for Easter, pumpkins and ghosts for Halloween, and Santa's and trees for Christmas. I recommend printing the games out on card stock paper and laminating with clear contact paper. This insures the games will last much longer. 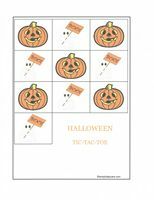 A simple manila envelope will make it easy to keep all the game pieces together. 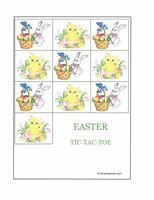 Start by printing out the holiday game grid with nine squares. Print out the holiday game of your choice. 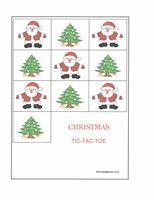 Cut out the individual squares so you have ten holiday playing pieces (five for each player). Then... start playing. I like the idea of letting the youngest player start first. Take turns placing the holiday squares onto the grid. Three in a row wins!